The loveliest posterboards of the campaign! Vital city housing demolished under Labour. Greens ask _why_? Green Councillors are concerned that the Labour-run City Council has disposed of significant social housing in Norwich and allowed it to be demolished without firm plans for replacement. In 2006, the Green Party opposed the City Council's decision to uproot council tenants and leaseholders at 50 flats in Barrack Street on the basis of developer plans for a mixed use development. In 2007, 19 sheltered flats at Greyhound Opening were 'decommissioned' and elderly residents were relocated. Both sites still lie empty. Green Councillor Paul Neale, County council candidate for Town Close said: "I am shocked, when there is a national housing crisis, and a local crisis made worse by the Bedroom tax, that tenants at Barrack Street and Greyhound Opening were moved against their wishes and the sites remain empty. The Green Party is pressing the Labour Cabinet at the City Council to urgently set out a solution to this issue." Green Party City Council candidate for Mancroft, Simeon Jackson says: "Norwich's housing stock is in need of refurbishment to bring it to modern energy efficiency standards. This would create local jobs and be a long-term investment - the Green Party's real alternative to destroying homes. We have been pressing the council to improve housing whenever we have the opportunity, such as within our proposal for the City Deals bid." The original flats on the South side of Barrack Street can still be seen on this old satellite picture at Google Maps - http://goo.gl/maps/rhlOA. Since the demolition of the flats, the site remains undeveloped, now 7 years on, behind a metal wall. 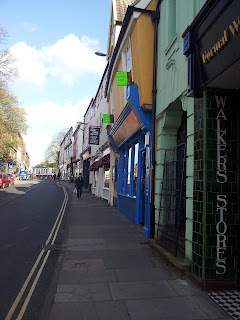 On May 15th: The meeting is at the Charing Cross Centre in St. John Maddermarket at 7.30. All welcome. 'Guardians for future generations' is my exact topic. Go 7 minutes in to hear RR's case for why we should #BanAdsAimedAtKids: http://www.bbc.co.uk/programmes/p016xrph This afternoon on BBC RadioNorfolk. Hear my debate this afternoon with a marketing man on Radio Wales (Go 1 hr 48 mins into this, to hear it: http://www.bbc.co.uk/programmes/b01rt4mm ) on whether or not we should ban ads aimed at kids. "I have been heartened by the interaction between Independents and Greens, and their attempts to restore democratic process to the governing of Norfolk. I wish every Green and every Independent Councillor-candidate good luck, and I'm positive that there will be more Green Party and more Independent Councillors on Norfolk County Council after the voters have had their say on May 2nd." Dr. Ian Gibson, former Labour Party MP for Norwich North. A straw in the wind from Bury St. Edmonds. When our Green candidate (and sitting Councillor) Mark Ereira-Guyer knocked he asked whether they'd like his election address as a Green - and they said 'Yes, absolutely'. 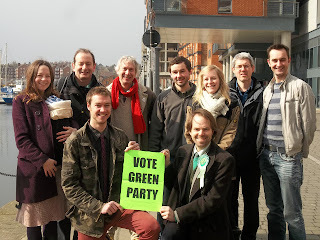 Me with some of the Green Party candidates standing in the County Council elections in Colchester, last weekend. Green Party East of England Co-ordinator. Despite 'the National' being part of our annual life when I was growing up, I won't be betting on any horses or taking time out of my weekend to watch it. So why the opposition? There will be activists from the Fight Against Animal Cruelty in Europe (FAACE) protesting outside Aintree station to raise awareness of the number of fatalities of horses in the race. The thing is: it is one thing for humans to take part in a risky sport, if they choose to. It is quite another to subject animals who have no choice in the matter to even greater risks. It is just wrong, it just ain't fair, to gamble with horses' lives every year in this way. It's time for the Grand National to fade out, and for jump-horse-racing to be put on hold. The new leader of the Green Party in England and Wales Natalie Bennett will be visiting Norwich tomorrow (Friday April 5th) to launch campaigning for the county council elections next month. She'll be visiting Norwich Foodbank to highlight the impacts of recent welfare cuts and find out why the foodbank expects a huge rise in people needing emergency food supplies. Ms Bennett said: "I'm visiting Norwich Foodbank to highlight widening inequality. On Saturday we will see a £100,000 tax break to UK millionaires, while this week's cuts hit struggling families and those receiving benefits the hardest." A key element of the Green Party platform for the forthcoming county council elections will be protecting services for vulnerable people. 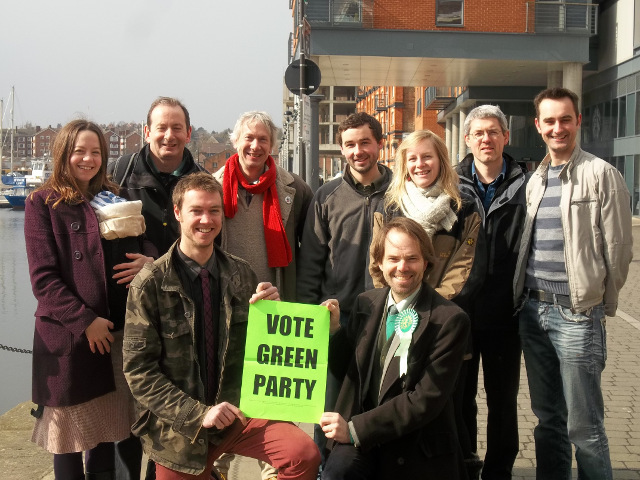 Norfolk has six Green county councillors, more than any other county in the country. At the county council budget meeting in February, the Green Party tabled an amendment to protect social care funding and mental health services. City Councillor Lucy Howard said: "Here in Norwich the recent cuts will result in a rise in the use of food banks by families plunged into poverty. The cuts will worsen child poverty, which in certain wards in Norwich is already very high: in Mile Cross 40 per cent of children live in poverty, as do 37 per cent in Wensum and 36 per cent in Mancroft." Norwich food bank has seen many local families referred to them by care agencies every week. Over 1,000 local children have been helped by their foodboxes in the last six months. Natalie will be accompanied by Dr Rupert Read, the east of England Green Party lead candidate for the next European Elections. They'll meet Project Manager Grant Habershon who will explain how Norwich food bank gave three days of food to 5,500 local people last year and that they expect that number to increase to over 8,000 local people this year. Mr Habershon told the Green Party that he expects the recent benefit changes, coupled with the current economic conditions, where wages and benefits are static and essentials such as food and energy prices are rising, to increase the need for food banks. Centre, 51 Ivy Road, Norwich NR5 8BF. 1. 2. 3. Rupert's Read: April 2013 4. 12. 15. 18. 19.